After the Big Bad Wolf Aftermath Sale at South City Plaza, we went cari makan. I got a bit "hyper". Super fly!!! Checking back the record, Mamarazzi realised that we only come to this restaurant once a year. he last time we came was last year. Last year, the shop was still one lot. This round we went, it had "grown". Now there are two shop lots. One with air-cond. Had their famous Claypot Loh Shi Fun. Taste as good as ever. One bowl is not enough! My "green noodles". That's what I call these beans. Taste very good. Young. Of course having Caypot Loh Shi Fun is not enough. I have to have some fried rice too. 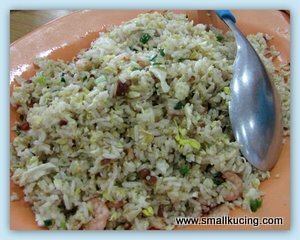 Yumm yumm..they added chopped "char Siew"(BBQ Pork) in the fried rice. i prefer fried loh shi fun..spicy ones..
i've been trying to find this place since a friend, who has since gone AWOL, brought me here for the loh shi fun, so i'm glad you posted it. even better if you can get me the GPS co-ords. wow, this one looks different huh?? the one i usually have is dark and dry one woh..
Wow! Claypot rat's tail is ma favorite. Is it translated as rat's tail? 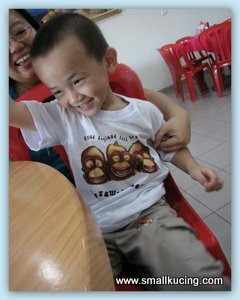 Seems the 'tail' is too short for a rat or loh shi fun means something else muahahaha. 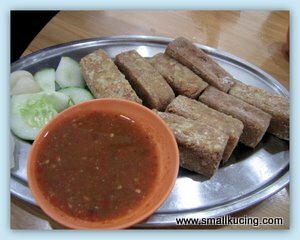 Somehow I can swallow Loh Shi Fun though I have tried many times. Even the laksa noodles also the same but sure the nasi goreng and veg are those I am drooling over. 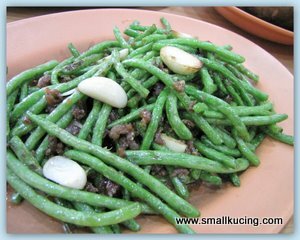 I really love the green beans..
interested to try this the next time you come KL?